DALLAS- Cadet Senior Airman Brandon Chee, from Dallas Composite Squadron, traveled to Altus, Oklahoma to fly in a Boeing KC-135 Stratotanker on October 2, 2018. Following are Cadet Chee’s thoughts as they happened that day. When I first received, out of the blue, an email inviting me to go to Altus Air Force Base to fly on a KC-135, I jumped at the opportunity. Seriously…how many civilians get to fly on military aircraft like the KC-135 Stratotanker, an aerial refueling aircraft? On October 2, the day finally came. I met up with the other two cadets from our squadron that were attending: C/Amn Brandon Luk, and C/SMSgt Walter Costello. After Capt Lana Holub drove for three hours to Altus, Oklahoma in the CAP van, we checked in at our hotel. Cadets and seniors from the Weatherford and Granbury squadrons were also there to partake in the flight. We met them at the Hampton Inn, where we swam with the cadets from the other squadrons, and later, ate as much Pizza Hut as we were able to stomach. The Dallas Dudes had lights off at 2200. We woke up promptly at 0545, and eagerly pulled on our boots and uniforms. The big day had come! We got breakfast at the hotel, and then Capt Becky Postma-Kegley, the organizer of the whole excursion, gave us our safety briefing. We hopped back in the CAP van, and we were off to Altus AFB! After a short wait and passing through security, we headed to the briefing room, where we received…you guessed it…a briefing. We then drove to the flight line, where a glorious sight awaited us. C-17s, KC-135s, and more - almost as far as you could see. Boarding the KC-135, we noticed that there were no cushy airline-style seats. Instead, there was a row of netting seats on the side of the plane. This was a first for many of us, because practically all airliners are equipped with forward facing seats. Earlier, in the briefing room, staff had handed us all earplugs. Capt James Farr, our orientator, instructed everyone to put on the earplugs for hearing protection. The KC-135 is equipped with four CFM-56 turbofan engines, each producing up to 21,634 pounds of thrust, adding up to a whopping 86,536 pounds. It was time for takeoff! After a rapid climb to our refueling altitude of 21,000 feet, the fun began. A C-17 Globemaster cargo plane roughly twice the size of the KC-135 soon appeared. The boom operator then walked from his seat in the cockpit to the boom operator’s pod, a small place aft of the APUs, on the underbelly of the aircraft. This is where the boom operator works magic. 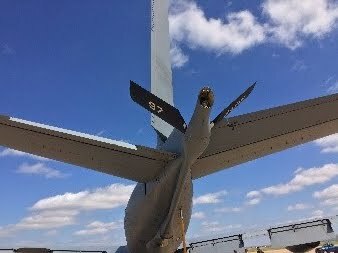 The boom on the back of the KC-135 is 229.66 feet long, when fully extended. Through the boom, fuel flows out at a maximum rate of 6,000 pounds per minute. The KC-135 holds a maximum fuel transfer load of 200,000 pounds. The boom operator then “flies” the boom over to the receiving aircraft, and as soon as the boom is connected, fuel transfer begins. On our flight, we made about 12 contacts with the C-17, and everyone had the chance to lie next to the boom operator and observe the action, sit in the cockpit, put on the headset, and talk to the pilots. About halfway through the flight, another KC-135 appeared above our plane while refueling a F-16, with the other F-16s flying around it. It was a beautiful sight. After all the contacts were made, it was time to return to Altus, after an awesome flight of approximately three and a half hours. Another cadet and I received the privilege to sit in the cockpit during landing. The boom operator returned to the navigator’s seat in the cockpit. 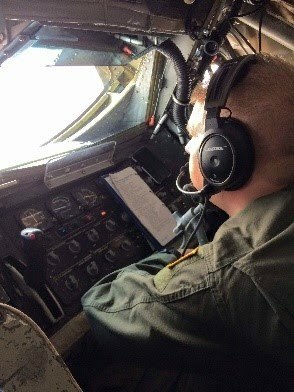 For most missions that the KC-135 flies, the navigator’s seat remains empty, due to modern technological advances. The pilot in control of the aircraft during landing did an outstanding job, with a beautiful landing. After disembarking from the plane, we took a group photo, and hopped on the bus, back to the terminal. We left Altus AFB after one of the most exciting days of our lives. That’s not the end of the story, however. We all rendezvoused at Braum’s Ice Cream and shared a meal before departing back home. We all headed our own separate ways afterwards. But Capt Holub, Cadets Luk and Costello, and I remain connected by the amazing experience we had that day. Altus 2018 will not leave our memories for a very long time. Huge thanks to Capt Lana Holub for driving us all the way to Altus and back, to Capt Becky Postma-Kegley organizing the whole trip, and to the aircrew! Without y’all, none of this would have ever happened. DALLAS- The weekly 391st Composite Squadron meeting on July 30th included an extraordinary event. That highlight of the evening was the Dallas Composite Squadron Change of Command Ceremony, with Major John Stafford retiring as Squadron Commander. Maj Stafford transferred the official CAP squadron guidon to Group III Commander Lt Col Phillip Crawford, and then Lt Col Crawford turned to present the squadron guidon to the incoming squadron commander, Major Scott Knightly. Major Knightly joined 391st squadron five years ago and is highly qualified in numerous Civil Air Patrol (CAP) specialties as a result of his 18 years as a CAP member. 391st will be led by an outstanding member. Knightly began his CAP career as a cadet on September 15, 2000 in Maine, and quickly advanced through the cadet ranks, achieving the Billy Mitchell and Amelia Earhart milestone awards. As an adult, Knightly transitioned to the adult member ranks and continued his professional growth and education in CAP, adding to his list of accomplishments. Some of those include qualification as Mission Scanner, Mission Observer, Airborne Photographer, Urban Direction Finding Team, Flight Line Marshaller, Flight Line Supervisor, and Mission Radio Operator – and that’s just to name a few! In addition to the broad reach of Knightly’s specialties, he has also served in duty positions that include Public Affairs, Communications, Finance, Personnel, and Professional Development across the country, with membership in the CAP Wings of Maine, Maryland, Florida, and Texas. If Scott Knightly gives the appearance of an over-achiever, his parents may be credited with providing the model of excellence. Lt Col Ken Knightly serves in the Northeast Region of CAP as Assistant Inspector General, and Col Merrie Knightly is the Northeast Region Assistant Critical Incident Stress Management Officer. The Knightlys make service to their community, state, and nation a priority in the family. Dallas Composite Squadron waits for the legacy to continue. Madison Applewhite, a junior at Highland Park High School in Dallas, Texas, has been selected to attend the summer programs at three prestigious institutions this June: West Point’s Summer Leaders Experience, US Naval Academy’s Summer Seminar, and US Air Force Academy’s Summer Seminar. Selection for the summer programs is highly competitive and offers outstanding high school juniors the opportunity to experience life at the Service Academies. Attendees eat and sleep in the same barracks or dormitories as fully appointed cadets and midshipmen, undergo daily activities such as physical training, and focus on academics that give the potential candidate an immersive experience. West Point explains that the one-week seminars are designed to help juniors with their college-selection process, while giving them an idea of the importance of leadership and sound decision-making in their education, careers, and lives. The selection criteria are based on academic performance, athletic and extracurricular achievement, leadership, physical fitness, self-discipline, and having good moral character. Applewhite has been involved in Civil Air Patrol (CAP), where she currently holds the CAP grade of Cadet Captain and has served as Cadet Commander of the Dallas Composite Squadron. Last summer, she completed solo flight at the CAP National Powered Flight Academy. In high school, Applewhite is a member of the Highlander Varsity Marching Band, which was ranked 10th in the State during the 2017 marching season, and the Wind Symphony, which performed at Carnegie Hall in New York City in 2016. She plays the bassoon, flute, and piano, and is also a member of the Girls Golf Team, National Honor Society, Spanish National Honor Society, and Ambassador Program. Applewhite is active in Christ the King Church, National Charity League, traveled to Argentina for foreign exchange, and will be attending Girls State this summer. Texas Girls State is held by the American Legion Auxiliary in Seguin, Texas, with the goal of educating rising senior high school students in the duties, privileges, and responsibilities of American citizenship. Applewhite is sponsored by American Educational Services, the CAP Dallas Composite Squadron, and Mr. Dulaney Howland. Dallas, TX – September 5, 2017 - Civil Air Patrol’s 391st Composite Squadron in Dallas, along with the 76th Composite Squadron in Grand Prairie and 390th Composite Squadron in Addison, conducted emergency missions to support the disaster response to Hurricane Harvey. Among volunteers from Dallas-Fort Worth who are have been assisting are flight and ground crews who train year-round to respond and serve their community, state and nation when called. On Friday, August 25, 2017, Hurricane Harvey slammed cities including Rockport, Port Aransas and Corpus Christi and was followed by torrential rain and devastation in Houston and the Southeast Texas coastal region. Immediately, thousands of volunteers and groups mobilized to assist in the recovery efforts. Several flight crew members of the 391st who accepted current missions recently earned the distinction of First Place Flight Crew in the Southwest Region Civil Air Patrol (CAP). On August 5, 2017, crews from six different states in CAP’s Southwest Region met in San Marcos, Texas and competed in a rigorous and timed evaluation that tested each crew’s knowledge and practical skills in search and rescue, disaster response, and mission operations. The highest scoring crew was from the 391st Composite Squadron at Dallas Love Field. The 391st represented the State of Texas after placing first in the Texas Wing Flight Evaluation on March 6, 2017. The members of the top-scoring 391st team are Lieutenant Colonel Don Gulliksen, Major Scott Knightly, Captain Brian Relin, and Captain Mark Holub. Relin announced that the big lesson he learned from Holub is to “do it with a purpose.” Holub stated the areas evaluated are keys to success during a critical incident response mission: crew resource management, teamwork, crew coordination, and delegation of responsibility. The competition helped to highlight the rapid response needed in an actual emergency mission which includes plotting the flight route, filing the flight plan, inspecting the plane before takeoff, flying the route precisely and staying focused on safety at all times. Additionally, these intense simulations help CAP flight crews and mission staff train for response to real world situations such as what Texas is now facing. Following the catastrophic effects of Hurricane Harvey, these CAP volunteers who have trained with a purpose were ready to proudly serve their community and state. Civil Air Patrol (CAP), the longtime all-volunteer U.S. Air Force auxiliary, has a track record of being called to support the State of Texas and has supported other federal disasters. Many people remember CAP volunteers assisting the search for debris after the Columbia Space Shuttle crash over Texas and Louisiana in 2003. CAP was also involved in disaster relief assistance after Hurricane Ike in 2008. And, most recently, CAP volunteers flew countless hours providing aerial photography following the flooding on Memorial Day in 2015. Civil Air Patrol, the longtime all-volunteer U.S. Air Force auxiliary, is the newest member of the Air Force’s Total Force, which consists of regular Air Force, Air National Guard and Air Force Reserve, along with Air Force retired military and civilian employees. CAP, in its Total Force role, operates a fleet of 550 aircraft and performs about 90 percent of continental U.S. inland search and rescue missions as tasked by the Air Force Rescue Coordination Center and is credited by the AFRCC with saving an average of 78 lives annually. Civil Air Patrol’s 56,000 members nationwide also perform homeland security, disaster relief and drug interdiction missions at the request of federal, state and local agencies. Its members additionally play a leading role in aerospace education and serve as mentors to more than 24,000 young people currently participating in the CAP cadet program. Performing missions for America for the past 75 years, CAP received the Congressional Gold Medal in 2014 in honor of the heroic efforts of its World War II veterans. CAP also participates in Wreaths Across America, an initiative to remember, honor and teach about the sacrifices of U.S. military veterans. 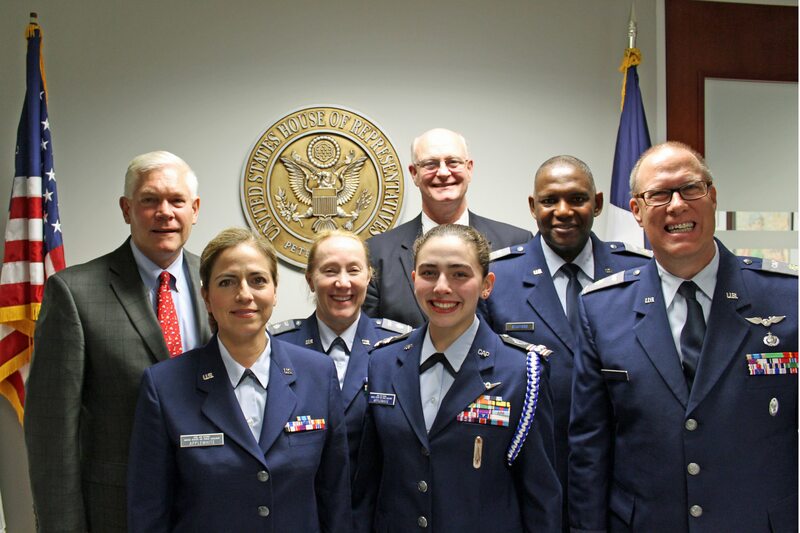 Pictured with U.S. Rep. Pete Sessions are Texas Wing Group III Civil Air Patrol members, left to right: (back row) Lt Col Phillip Crawford, Maj John Stafford, Maj Don Gulliksen, (front row) 1st Lt Blanca Applewhite, Lt Col Kelley Johnson, and C/Capt Madison Applewhite. DALLAS – Members of Group III Texas Wing of Civil Air Patrol held a briefing with United States Representative Pete Sessions, on Thursday, May 11, 2017. The briefing included a report on the State of Texas Wing and squadrons in the North Texas area. Congressman Sessions joined the Congressional Squadron and is authorized by CAP regulations to fly in CAP aircraft, visit unit meetings and social events, and also receive the honorary grade of Lieutenant Colonel. Sessions was actively engaged in the discussion on the status of the aerospace education, cadet programs, and emergency services missions. CP Members routinely undertake U.S. Air Force tasked search and rescue missions, aerial photography missions, Joint Task Force counter drug/counter narcoterrorism operations, as well as educate and mentor young members in leadership, character development, safety, and aerospace education lessons. Equally impressive was the list of National Cadet Special Activities in which the Texas CAP Cadets will be participating this summer throughout the country, including Cyber Defense Training Academy, Powered Flight Academy, National Blue Beret at EAA Airventure Oshkosh, and Air Force Pararescue and Survival Orientation Course. 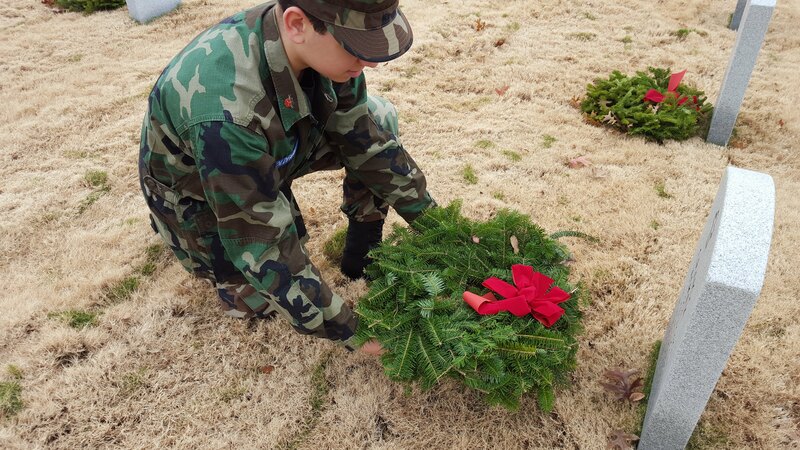 Both cadets and senior members support Wreaths Across America, fulfilling the goal of remembering veterans with memorial wreaths at National Cemeteries during the months of November and December. Prior to joining CAP, Lt Col Sessions has been a staunch supporter of CAP in many ways. As the son of a U.S. Air Force veteran, Sessions recognized the importance of CAP’s emphasis on integrity, volunteer service, excellence and respect as core values for the future leaders of the United States. Sessions has met numerous times with CAP commanders and congressional liaisons, and encouraged CAP cadets to pursue training in the U.S. military and U.S. service academies. In 2014, Sessions cosponsored the congressional act to honor the World War II members of Civil Air Patrol with a Congressional Gold Medal for their wartime missions and protection of the home front. 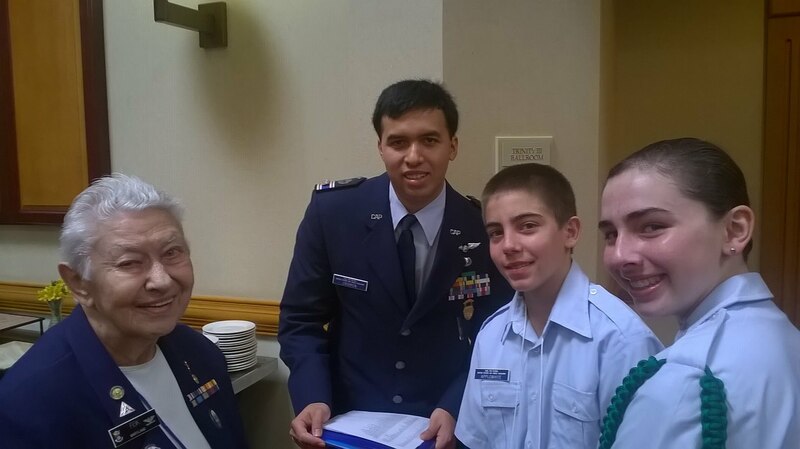 Civil Air Patrol, the longtime all-volunteer U.S. Air Force auxiliary, is the newest member of the Air Force’s Total Force, which consists of Regular Air Force, Air National Guard and Air Force Reserve, along with Air Force retired military and civilian employees. CAP, in its Total Force role, operates a fleet of 550 aircraft and performs about 85 percent of continental U.S. inland search and rescue missions as tasked by the Air Force Rescue Coordination Center and is credited by the AFRCC with saving an average of 70 lives annually. Civil Air Patrol’s 58,000 members nationwide also perform homeland security, disaster relief and drug interdiction missions at the request of federal, state and local agencies. Its Airmen additionally play a leading role in aerospace education and serve as mentors to more than 24,000 young people currently participating in the CAP cadet program. Civil Air Patrol received the Congressional Gold Medal in 2014 in honor of the heroic efforts of its World War II veterans. Congressionally chartered 75 years ago, the nonprofit organization also participates in Wreaths Across America, an initiative to remember, honor and teach about the sacrifices of U.S. military veterans. Dallas-It was a cool gray, overcast and rainy day on which to recognize and remember fallen American heroes. It was the one day set aside each year to place wreaths on the grave sites and columbariums of veterans at Dallas-Ft. Worth National Cemetery in Grand Prarie Texas. Slightly more than 2,000 Civil Air Patrol cadets, Boy Scouts, Sea Scouts, Young Marines and Senior Members answered the call to join civilians on this day of recognition. This year, Saturday December 12th marked the day to place the honors for the men and women of all of the nation’s armed services. Overseeing the North Texas project was 2nd Lt Joan L. Gulliksen assisted by Capt Lana Holub both members of the 391st Composite Squadron Group III Texas Wing Civil Air Patrol. According to Lt Gulliksen over 10,000 wreaths were placed on graves and at columbariums in the National Cemetery”. She said “It was an honor to be chosen to be the North Texas coordinator for such a gesture that means so much to so many”. Captain Holub commented “It is always impresses me to see how many cadets and civilians participate in this solemn ceremony” and Cadet/CMsgt Emelia McLaughlin said “As a cadet this is a big project with an even bigger reward. We look forward each year to honoring the veterans who gave everything for us and asked for little in return”. December 13, 2014, Dallas-Fort Worth National Cemetery, Dallas, TX. The Dallas Composite Squadron attended the annual Wreaths Across America event at the Dallas-Fort Worth National Cemetery. The mission of Wreaths Across America, Remember, Honor, Teach, is carried out in part by coordinating wreath laying ceremonies on a specified Saturday in December at Arlington, as well as veterans’ cemeteries and other locations in all 50 states and beyond. The message is about the importance of remembering fallen heroes, honoring those who serve, and teaching children about the sacrifices made by veterans and their families to preserve our freedoms. This is made possible by thousands of volunteers who organize local ceremonies, raise funds to sponsor wreaths, and participate in the events. No government funding is used. The cost of the program is paid by individual wreaths sponsors, corporate donorsand volunteer truckers. SM J. Gulliksen of Dallas Composite Squadron organized the event. Major Don Gulliksen, also of Dallas Composite Squadron was the Master of Ceremonies. DALLAS-Civil Air Patrol squadrons in North Texas were flooded with requests for assistance by both federal and local officials during the recent bad weather that blanketed the nation’s midsection. In addition to aircraft and aircrews the 391st furnished ground mission specialists both senior and cadets to the effort. These specialists are a vital part of the mission who staff the Incident Command Headquarters located in various cities throughout the state. As the situation changed the Incident Headquarters was moved to different cities. Initially the office was established in El Paso and later moved to Denton to better serve changing needs. Other Groups and squadrons in North Texas furnished additional facilities, aircraft and aircrews to the Wing effort. Civil Air Patrol, the official auxiliary of the U.S. Air Force, is a nonprofit organization with 61,000 members nationwide, operating a fleet of 550 aircraft. CAP, in its Air Force auxiliary role, performs 90 percent of continental U.S. inland search and rescue missions as tasked by the Air Force Rescue Coordination Center and is credited by the AFRCC with saving an average of 80 lives annually. Its volunteers also perform homeland security, disaster relief and drug interdiction missions at the request of federal, state and local agencies. Fort Worth, TX- Texas Wing Conference was held Saturday, April 18 2015 at the DFW Marriott South. Senior members and cadets attended various classes and had opportunities to see presentations by exceptional speakers including Air Force personnel, Lockheed Martin engineers, and Wing Command. Highlights included the presentation of Congressional Gold Medal replicas to WWII CAP honorees, meeting CAP member and aviation pioneer, Col Mary Feik, and observing the Change of Command Ceremony installing Col Steve Hudson as Texas Wing Commander. Feik is credited with becoming the first woman engineer in research and development in the Air Technical Service Command’s Engineering Division. She's accomplished so much but here's what she says about her proudest moment, in 2003: "My ultimate honor [is] the Civil Air Patrol cadet achievement created in my name."